Five Ways to Use Craft Foam in Cosplay « Adafruit Industries – Makers, hackers, artists, designers and engineers! Body armor – Want to make lightweight and affordable armor? Turn to craft foam. Once you make your patterns either from a design of your own or from files available online, trace the pieces onto craft foam with a ballpoint pen. Use a gentle touch, and the pen will roll right over the surface of the foam without snagging. Label the pieces as you make them (on the underneath if you won’t be painting them). Then it’s a matter of shaping the pieces to curve to your body. You can use a heat gun for this. Eventually, you can glue the pieces together and paint them. The above video will help you, and this tutorial from Entropy House goes through the process step by step. Patterns – If you want to use Worbla or Sintra for your project, pattern it out with craft foam first. As previously mentioned, it’s relatively inexpensive – much more so than Worbla. Make sure your design works with craft foam before you start cutting and shaping pricier material. Crown – The thing about wearing a metal crown with your cosplay is that it can get heavy and uncomfortable. If you want a more flexible option that won’t dig into your scalp, use craft foam. You can cut the material into a circlet or an elaborate headdress. You can make sure the crown retains its shape by using layers of glue on the back/inside of the foam pieces to stiffen it (seal it first). Watch the above video to learn the ins and outs. Wings – Wings should be light enough for a cosplayer to wear for a few hours, but they also need to have enough weight to not flap around while a cosplayer walks (unless he or she wants them to). Craft foam is a suitable medium to achieve the right look and heft. They won’t move like faux feathers, but you can replicate the layered look by cutting several feather-shaped pieces. DeviantArt user Zexion-the-gamer has a helpful how-to. Gauntlets – My favorite thing about craft foam is you can turn it into gauntlets or a collar piece or whatever you need with a small amount of time and effort. I needed to make gauntlets for my Amethyst costume in a hurry so I fit two sheets of yellow craft foam around my arms and cut them into shape. I used hot glue (puff paint would have been a better choice, but it worked out okay) to create the raised patterns on the gauntlets and applied a few thin layers of gold acrylic paint once the glue completely dried. 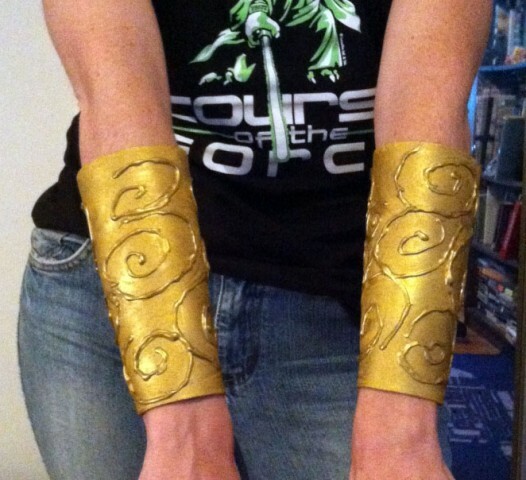 I added a couple pieces of Velcro on the insides of the bracers/gauntlets, and tada: quick fix gauntlets done.